Border from a piece of new October Afternoon Daily Flash Milk Money - the perfect collection for someone whose parents were teachers. It''ll keep me going until the Public Library collection finally appears! "You don't know how to go to the app store, do you Auntie Sian?" "You don't know how to make a telephone out of two tin cans and a piece of string, do you ?" Hope your weekend is turning out to be a good one. There's a snowy sky here - we need to get out for a walk before it starts, I think! There is so much I like about this post. First, the title is sooo perfect. These little whippersnappers today can run rings around me when it comes to technology. My little "e" blew me away with her ability to get around the internet when she was looking for something at Michaels. And then, the layout itself---I just got "milk money" and am looking forward to using it. Love the apple. And your reference to the tin cans and string---a little walk down memory lane for me. What a great way to start my day! Ah, you never had problems with your battery running out or lack of signal in the good old tin can and string days, did you? Isn't it amazing how technically savvy little kids are nowadays - I'm guessing Little E will be able to help you a lot with sorting out that new phone. Oh the memories this just brought back! Batteries? What were they? I can't believe how even the smallest child seems to know their way around computers, phones etc. I love this post [and the age],Sian. I could use the tin can phones much more effeiciently than I can use my present one!!! What a gorgeous page (although, you know me, I love any page where Little E has a starring role!). It's really quite scary just how quickly they grasp technology. This is just wonderful in every way, Sian - visually, the story, the colours ... Such charm! both of you, and it :). touch screens!!! I hate them! I have a year to go before I can change my phone and it will be back to the Blackberry for me. I really REALLY hate the touch screen. I keep touching it you see. I keep touching it wrong so it does things and then I have to shut it down and find a way of stopping it doing things. What a fantastic page. I love the twine, brilliant touch. Little E, awesome as always. LOL! Great page and great response! love love love this page Sian and what a brilliant reply to the clever little E. Sometimes I long for the simplicity and flexibility of the tin can and ball of string. When you finished on the phone you could re arrange the string and make stilts. Oh yes - too true. And a lovely LO. ahhh a wonderful page Sian...I have no idea when it comes to technology either. i have trouble working the telly sometimes, so the phone goes way over my head!! The design of this layout is simply wonderful, and so is the story! Lucky me, I live with a man that does Mac tutoring so there's almost always an answer available if I can't figure it out on my own. That's a lovely page Sian and it brings back happy memories of improvisation. It is embarrassing how little ones are so good at technology - my just three year old granddaughter puts me to shame on the ipad! Charming page - and quick thinking of you to give Little E a little historic perspective. Oh, maybe I should have used the h word! Great words and pictures and scrapping ... lovely post and page. Loved reading this post and loved your comment to Little E about making a telephone from 2 tin cans! I love the layout! I still haven't set up the photo printer I got for Christmas. . . I was only chatting with friends this morning about the " younger generation having different views on hand me downs..." infact I better not get started ...!! that really made me laugh Sian! Little E is so funny and it is just the sort of thing my son would say! I can't tell you how much i love this! From the page, the design to the hilarious journaling, this is the kind of thing that make me glad i scrapbook! You're a genius Sian! I like the design with those Polaroid frames askew, those photos and the twine and of course the journaling. Such fun. We've just upgraded the lap top which came with Windows 8 and it is driving me mad! I wish I had teens to do all the managing the cross over bit! 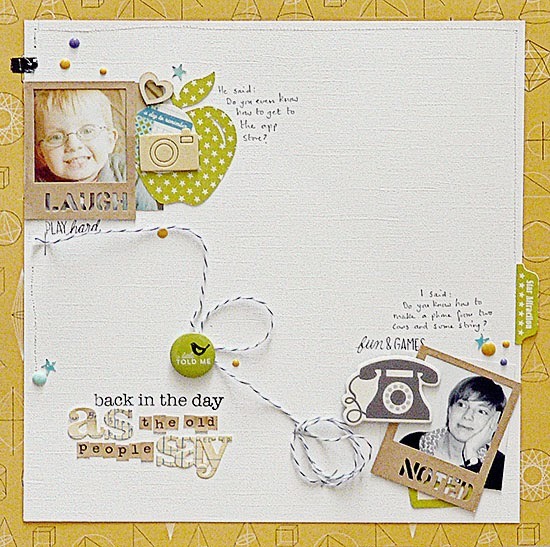 I adore this layout and the telephone theme! This LO has so much white space and yet has so much detail to it. I love the he said/she said component and the comparison of new and old "technology." I love the string joining the two photos. We had so much fun as kids making tin-can telephones.